Blogodidact: Of the 2nd Amendment, bumpstocks, and philosophic step-brothers. Of the 2nd Amendment, bumpstocks, and philosophic step-brothers. Trump's bump-stock ban is, to the extent that I know the details of it (still minimal), IMHO, unacceptable. Bad news. Unsupportable. A dangerous wedge. However, it's hardly an indication of Trump's hostility to what the 2nd Amdt defends and preserves, it's just more of the typical poorly thought out attempts at being 'reasonable', which the Right is so painfully afflicted with (Bill O'Reilly is another example). But poor decisions such as this, dangerous though they are, aren't evidence of Trump being opposed to the 2nd Amendment, but only that he doesn't fully grasp what it's meaning and purpose is. 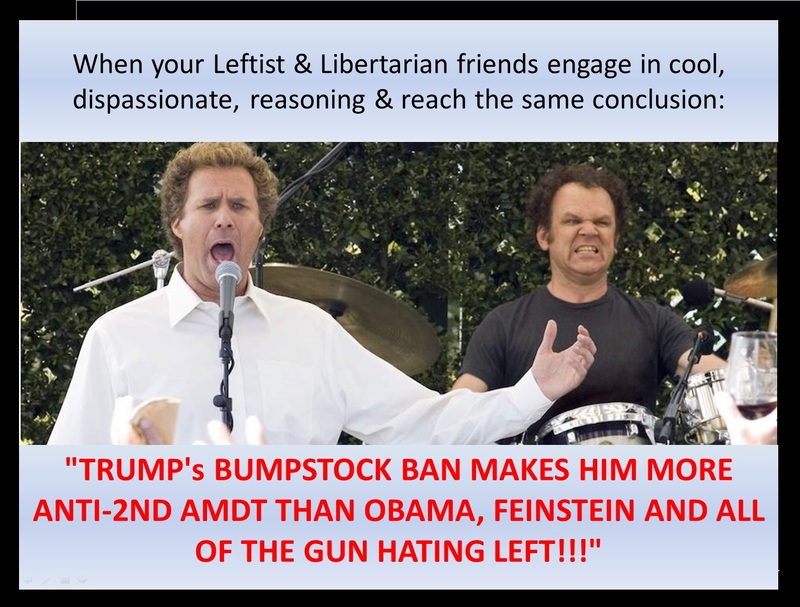 There is no credible, supportable, argument, IMHO, that the ATF's banning of the bump-stock accessory, can be compared with Hillary's praise of Australia's methods of gun confiscation, or of Obama, Feinstein, Swalwell and all of the rest of the Pro-Regressive Left & Right's persistent efforts at banning 'assault rifles', demonizing gun owners, attempting to deprive returned veterans or elderly of such rights via medical 'concerns', and other and various efforts to directly, or indirectly, limit our right to keep and bear arms (not just firearms), and to make that claim is little short of buffoonery. The outlandish claims and memes that I've seen this week, primarily coming from my Leftist and Libertarian friends, does much to hint at their common parentage and status as philosophic step-brothers. Before things get all too busy, wishing you and your readers a Merry Christmas. Thank you, and a Merry Christmas to you and yours! Happy 227th Birthday to our Bill of Rights!